Final pics of Dove Love for a while, BoInk update, and a Lizzie*Kate finish-finish! 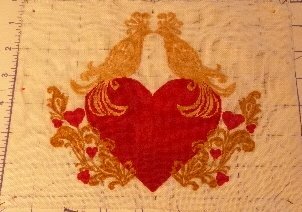 Dove Love at the stitchery “spa” – can you see the pins? Ahh, relaxing all the tension on the left side. Time for a back massage! I mean, press. LOL, for those who like to check others’ work, here you go. Remember, this is over-1. Go ahead, compliment me. 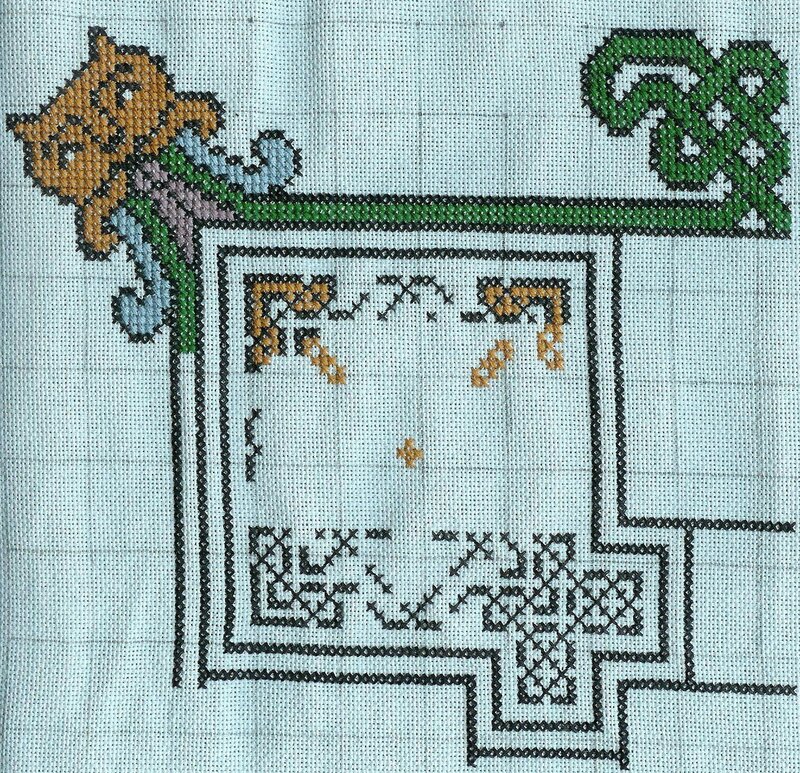 BoInk week 5 – I did more of the black knotwork at the bottom, just to be sure I was all-good. 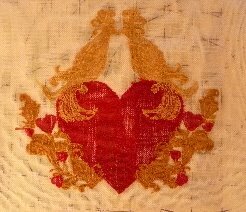 Then I went back to the top of this motif to start filling in. Very much enjoying this project, I wish I could do more than one day a week on it! And Lizzie*Kate! Gift #1 is stitched and finished! 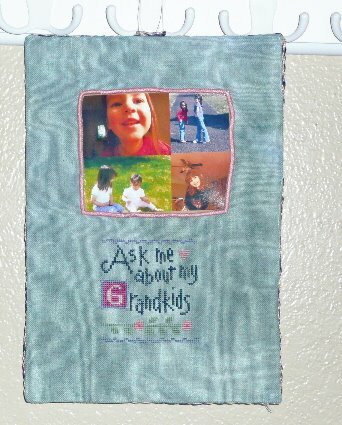 This is an L*K snippet, “Ask Me About My Grandkids”, Silkweaver Solo 28ct Cashel Linen, DMC flosses. Finished as a photo frame, using satin stitches to reinforce the cutout. The fabric is glued, but the picture can be changed. Yay, me! It even has a ribbon hanger (it’s hanging on a coat hook in the pic), and handmade cording to cover the seams. Backing fabric nearly matches the linen. I’m not sure why it’s so weird looking in the pic – it’s kind of a cloudy-aqua, and I had some quilting fabric on hand that matched. Thank you to Vonna (The Twisted Stitcher) for her flat-fold instructions – I’m adapting them to other finishing techniques, as you can see. How cute is that Lizzie Kate! I love it!